For years now, in the news, TV shows, and movies there has been a plethora of those practicing necromancy, only different from past years, it’s not a shameful thing. Sadly, even among those in the church there are people watching shows like the one where the woman talks to the dead to get information, or “help them go on to the afterlife” and it’s all depicted as compassionate and wonderful in the advertisements. I went to one neighbor’s home and in sharing some things she told me her brother walked in her bedroom and walked into the kitchen, and he’d been dead 6 years. I then tried to explain as gently as I could from the word, that that is impossible, that he would appear to her if he is dead. I related the story of Lazarus and the Rich man from Luke 16 to show her God doesn’t allow that. That ghosts are actually familiar spirits [demons] who have the ability to imitate human being forms to divert people from seeking God. To sorcery and divination from doing this. Sorcery in the greek is pharmakeia, from which we get the word “pharmacy”. God once told me that HE didn’t want us dependent on ANYTHING but HIM. That is to say ANYTHING THAT IS USED TO ALTER YOUR SOULISH REALM in reliance and dependence on it vs GOD, Whose presence brings all we need, is SORCERY and Divination if it is from drugs/herbs/food realm and a form of IDOLATRY because we are putting IT before seeking GOD for what we need. The Lord once showed me that about my mother who got into witchcraft in her 30’s through some people she bowled with on a team. Suddenly she was doing a séance in the house, and tarot cards were something I found when she died. Later in her 30’s when I was in foster care home, she got into a new age cult called UNITY and went to their seminary to “become a minister”. After she came back from that she developed LUPUS. You see she’s been raised to serve Christ, and sang to HIM, but then looking for other sources got her fascinated and doubting the GOD she knew and trying to make herself a “god”. It is painful to see such a tormented life. My grandfather was a Pentacostal Holiness minister who did tent revivals, but also dabbled in FREEMASONRY. So there was a ROOT in her never repented of that led her down a dark path into fascination with the occult. Part of that was her UNWILLINGNESS TO FORGIVE all the rejection in her life or give up all the hatred, anger, and pride in her heart till the end. In her last week I felt she had made a change after fasting for her, but it could not be communicated as she was on a respirator last few days in the hospital. I have sent out articles, and Amanda Buys renouncement prayers and posted them for people on my list so that they will be aware that they must repent for the sins of the generations who have gone after other gods, and all sinful practices, just like they did in Nehemiah 9:1-4. My own experience is that such familiar spirits are higher level occultic spirits and do not leave “easily”, unless there is nothing in us to hang onto as legal rights go. Sometimes they have a right through our pride in ethnicity and family history, to stay, or though our control issues, that are undergirded the Lord says by the pride and fear that make up CONTROL strongholds. When the people from Toronto came to our church I went through a lot of healing and deliverance due to the manifest presence of the Holy Spirit faster than normally it would take. In one meeting I was convicted of needing to repent for the necromancy from my mother. Now I had not ever done ouija board, or participated in her occultic stuff, though she would later on in my life send me astrology charts and predictions. But I had to repent from it to get free of that spirit. On the way home I got deliverance and had to stop the car and puke as I was praying in tongues against it. It is likely that some of that was very much in my family line from the masonry. Anubis, the god of mummification is one that the masons honor. But also in many cultures people get into talking to the spirits of the dead ancestors for advice [ spiritism]. They don’t realize who they are really getting advice from. Now it’s very popular as the occult has risen in this land, and TV personalities have made the occult popular. 10 Enter into the rock, and hide in the dust, from the terror of the Lord and the glory of His majesty. 11 The lofty looks of man shall be humbled, The haughtiness of men shall be bowed down, and the Lord alone shall be exalted in that day. 16 Upon all the ships of Tarshish, and upon all the beautiful sloops. 17 The loftiness of man shall be bowed down, And the haughtiness of men shall be brought low; The Lord alone will be exalted in that day, 18 But the idols He shall utterly abolish. 19 They shall go into the holes of the rocks, And into the caves of the earth, from the terror of the Lord and the glory of His majesty, When He arises to shake the earth mightily. Has HE not been shaking the earth of late ? Last year was unprecedented in numbers of great earth quakes, storms, floods. The Lord mentions being filled with eastern ways. Well Yoga, is very popular now even in the church, and the church in India and China could teach us a few things about the error of that. I was listening to a song from a Mike Bickle album and I got a revelation of Mary when she cleaned the feet of Jesus with perfumed oil and wiped His feet with her hair. What the Lord showed me is that the Pharisees were not irritated ONLY by her sinfulness, but also disdain because by doing so was honoring HIM as GOD. Judas of course was covetous of the money, though he pretended to care about the poor. But the bending down at His feet, and of course there is so much more to that scene, but for purposes of this teaching, just want to leave it at this. Let’s look at the incident in 1 Samuel to see Saul consulting with a medium to talk to the dead Samuel. 7 Then Saul said to his servants, "Find me a woman who is a medium, that I may go to her and inquire of her." And his servants said to him, "In fact, there is a woman who is a medium at En Dor." 8 So Saul disguised himself and put on other clothes, and he went, and two men with him; and they came to the woman by night. And he said, "Please conduct a seance for me, and bring up for me the one I shall name to you." 9 Then the woman said to him, "Look, you know what Saul has done, how he has cut off the mediums and the spiritists from the land. Why then do you lay a snare for my life, to cause me to die?" 10 And Saul swore to her by the Lord, saying, "As the Lord lives, no punishment shall come upon you for this thing." 11 Then the woman said, "Whom shall I bring up for you?" And he said, "Bring up Samuel for me." 12 When the woman saw Samuel, she cried out with a loud voice. And the woman spoke to Saul, saying, "Why have you deceived me? For you are Saul!" 13 And the king said to her, "Do not be afraid. What did you see?" 14 So he said to her, "What is his form?" And she said, "An old man is coming up, and he is covered with a mantle." And Saul perceived that it was Samuel, and he stooped with his face to the ground and bowed down. 15 Now Samuel said to Saul, "Why have you disturbed me by bringing me up?" And Saul answered, "I am deeply distressed; for the Philistines make war against me, and God has departed from me and does not answer me anymore, neither by prophets nor by dreams. Therefore I have called you, that you may reveal to me what I should do." 16 Then Samuel said: "So why do you ask me, seeing the Lord has departed from you and has become your enemy? 17 And the Lord has done for Himself* as He spoke by me. For the Lord has torn the kingdom out of your hand and given it to your neighbor, David. 18 Because you did not obey the voice of the Lord nor execute His fierce wrath upon Amalek, therefore the Lord has done this thing to you this day. 19 Moreover the Lord will also deliver Israel with you into the hand of the Philistines. And tomorrow you and your sons will be with me. The Lord will also deliver the army of Israel into the hand of the Philistines." 21 And the woman came to Saul and saw that he was severely troubled, and said to him, "Look, your maidservant has obeyed your voice, and I have put my life in my hands and heeded the words which you spoke to me. 22 Now therefore, please, heed also the voice of your maidservant, and let me set a piece of bread before you; and eat, that you may have strength when you go on your way." 23 But he refused and said, "I will not eat." Verse 13 comparisons show there is some problem with some versions. Amplified and NKJV say the woman saw a being or god coming out of the earth but the original Hebrew says elohim which is PLURAL. She saw demons coming up – familiar spirits. Such spirits are conjured up in séances, ouija board, crystal gazing and other witchcraft practices. For a long time I felt God showed me that when she called up Samuel, that it was not really Samuel, but a familiar spirit imitating Samuel. This is what happens with most ghost apparitions. I say most, only because there is a time right after death where it appears from researchers, that the body can roam the earth for a very short time till it goes to it’s destination. People have had out of body experiences, died in the emergency room and come back to their bodies. In those experiences, they have seen the actions of all those in the room from above, and even outside of the room in many, many experiences reported. But then they either return to the body or go on to their destination. They are NOT around 1 week, 3 months, or 6 years later to converse with family. 1 Sam 28:13 KJV And the king said unto her, Be not afraid: for what sawest thou? And the woman said unto Saul, I saw gods ascending out of the earth. 1 Sam 28:13 Amp The king said to her, Be not afraid; what do you see? The woman said to Saul, I see a god [terrifying superhuman being] coming up out of the earth! 1 Sam 28:13 GENEVA Bible And the king said unto her, Be not afraid: for what sawest thou? And the woman said unto Saul, I saw 1 gods ascending up out of the earth. 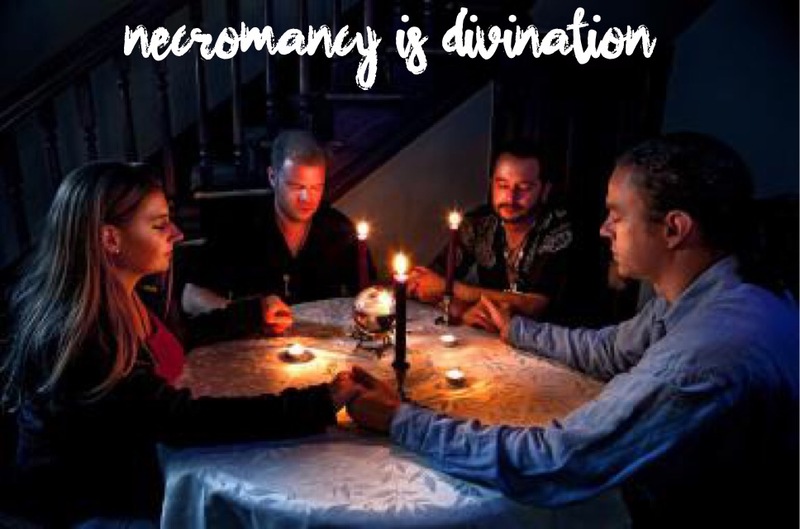 The practice of divination, in this form, necromancy invites demons into this dimension, just as do ouija board, and other forms of divination and other occult practices. So this guy on TV who says he talks to the dead and lets people know what they are saying is talking with demons. You cannot drink the cup of demons and the cup of the LORD. 1 Cor 10:18-22 NKJV 18 Observe Israel after the flesh: Are not those who eat of the sacrifices partakers of the altar? 19 What am I saying then? That an idol is anything, or what is offered to idols is anything? 20 Rather, that the things which the Gentiles sacrifice they sacrifice to demons and not to God, and I do not want you to have fellowship with demons. 21 You cannot drink the cup of the Lord and the cup of demons; you cannot partake of the Lord's table and of the table of demons. 22 Or do we provoke the Lord to jealousy? Are we stronger than He? Now Paul is addressing the issue of eating what is sacrificed to demons, but the same principle holds true for going to demons for information vs GOD. That is the whole point of divination being sin. Ps 14:2-3 NKJV 2 The Lord looks down from heaven upon the children of men, To see if there are any who understand, who seek God. 3 They have all turned aside, They have together become corrupt; There is none who does good, No, not one. Isa 8:19-20 NKJV 19 And when they say to you, "Seek those who are mediums and wizards, who whisper and mutter," should not a people seek their God? Should they seek the dead on behalf of the living? 20 To the law and to the testimony! If they do not speak according to this word, it is because there is no light in them. So entertaining this form of amusement on TV invites also such demons. Christians are forbidden to do so. In Luke 16 we have another example that speaks to this issue. It is the parable of the Rich man and Lazarus. 19There was a certain rich man who [habitually] clothed himself in purple and fine linen and w reveled and feasted and made merry in splendor every day. 20And at his gate there x was [carelessly] dropped down and left a certain y utterly destitute man named Lazarus, [reduced to begging alms and] covered with [z ulcerated] sores. 21He [eagerly] desired to be satisfied with what fell from the rich man's table; moreover, the dogs even came and licked his sores. 22And it occurred that the man [reduced to] begging died and was carried by the angels to Abraham's bosom. The rich man also died and was buried. (1.) His soul existed in a state of separation from the body. It did not die, or fall asleep, with the body; his candle was not put out with him; but lives, and acted, and knew what it did, and what was done to it. (2.) His soul removed to another world, to the world of spirits; it returned to God who gave it, to its native country; this is implied in its being carried. The spirit of a man goes upward. (3.) Angels took care of it; it was carried by angels. They are ministering spirits to the heirs of salvation, not only while they live, but when they die, and have a charge concerning them, to bear them up in their hands, not only in their journeys to and fro on earth, but in their great journey to their long home in heaven, to be both their guide and their guard through regions unknown and unsafe. The soul of man, if not chained to this earth and clogged by it as unsanctified souls are, has in itself an elastic virtue, by which it springs upward as soon as it gets clear of the body; but Christ will not trust those that are his to that, and therefore will send special messengers to fetch them to himself. One angel one would think sufficient, but here are more, as many were sent for Elijah. Amasis king of Egypt had his chariot drawn by kings; but what was that honour to this? Saints ascend in the virtue of Christ's ascension; but this convoy of angels is added for state and decorum. Saints shall be brought home, not only safely, but honourably. What were the bearers at the rich man's funeral, though, probably, those of the first rank, compared with Lazarus's bearers? The angels were not shy of touching him, for his sores were on his body, not on his soul; that was presented to God without spot, or wrinkle, or any such thing. "Now, blessed angels," said a good man just expiring, "now come and do your office." (4.) It was carried into Abraham's bosom. The Jews expressed the happiness of the righteous at death three ways:—they to go to the garden of Eden: they go to be under the throne of glory; and they go to the bosom of Abraham, and it is this which our Saviour here makes use of. Abraham was the father of the faithful; and whither should the souls of the faithful be gathered but to him, who, as a tender father, lays them in his bosom, especially at their first coming, to bid them welcome, and to refresh them when newly come from the sorrows and fatigues of this world? He was carried to his bosom, that is, to feast with him, for at feasts the guests are said to lean on one another's breasts; and the saints in heaven sit down with Abraham, and Isaac, and Jacob. Abraham was a great and rich man, yet in heaven he does not disdain to lay poor Lazarus in his bosom. Rich saints and poor meet in heaven. This poor Lazarus, who might not be admitted within the rich man's gate, is conducted into the dining-room, into the bed-chamber, of the heavenly palace; and he is laid in the bosom of Abraham, whom the rich glutton scorned to set with the dogs of his flock. 23And in Hades (the realm of the dead), being in torment, he lifted up his eyes and saw Abraham far away, and Lazarus in his bosom. 24And he cried out and said, Father Abraham, have pity and mercy on me and send Lazarus to dip the tip of his finger in water and cool my tongue, for I am in anguish in this flame. Can you imagine the arrogance, that now he is in Hades, and he is demanding that the very man he shunned come serve him water ? 25But Abraham said, Child, remember that you in your lifetime fully received [what is due you in] comforts and delights, and Lazarus in like manner the discomforts and distresses; but now he is comforted here and you are in anguish. How kind of Father Abraham…truly a fatherly response. 26And besides all this, between us and you a great chasm has been fixed, in order that those who want to pass from this [place] to you may not be able, and no one may pass from there to us. 28For I have five brothers--so that he may give [solemn] testimony and warn them, lest they too come into this place of torment. 29But Abraham said, They have Moses and the Prophets; let them hear and listen to them. 30But he answered, No, father Abraham, but if someone from the dead goes to them, they will repent (a change their minds for the better and heartily amend their ways, with abhorrence of their past sins). 31He said to him, If they do not hear and listen to Moses and the Prophets, neither will they be persuaded and convinced and believe [even] if someone should rise from the dead. So no ghosties. Ghosties are demonic entities, and there is not any purpose Abraham makes it clear for such when the WORD has been given to us for a compass on how to live our lives. So anyone who has read the Word of God, there is no excuse. They can’t say, gee I didn’t know it was wrong, unless blinded by perversion, from abuse which can make one not able to understand, or due to deaf & dumb spirits. And even then once saved can be delivered. But those outside are prone to delusion and deception of all kinds. if we throw ourselves into the pit of destruction, there is no coming out. It is a pit in which there is no water, and out of which there is no redemption. The decree and counsel of God have fixed this gulf, which all the world cannot unfix. This abandons this miserable creature to despair; it is now too late for any change of his condition, or any the least relief: it might have been prevented in time, but it cannot now be remedied to eternity. The state of damned sinners is fixed by an irreversible and unalterable sentence. A stone is rolled to the door of the pit, which cannot be rolled back. Once rid of it to practice keeping away from such practices. You invite it into your home also if you watch it on TV or in the movies. So be aware of what you watch. Keep your eyes from evil as best you can. There is no way to live in the world without some exposure, but keeping your heart pure before the Lord is important to overcoming and being in His presence. After a young person was here the other night, I had a visitation of demonic sorts. I heard a voice audibly and it sounded just like her voice in my living room where I was sleeping on the couch where we had sat. She is dating a Persion whose father is Christian, but mother is muslim. So I believe it was something perhaps she picked up from him, or that is generational in her family line since her mom practices witchcraft at times, still, proclaiming to be Christian. I rebuked it and turned on worship. Today again in communications with someone, I had an attack of divination on my eyes, which makes me have an aura, like when you’re getting a migraine, and then my eyes get sensitive and screwy vision. But after having scriptures on and worship it left. Sometimes these days because these spirits are so prevalent around us, you don’t need to do anything, but they seeing the anointing on you will try to get in and cause torment. People all around us ARE watching shows and movies that have this stuff, so we need to not ignore the discernment that God gives us to be able to combat these spirits. Father, I ask that if anyone here is struggling with battling such spirits, that YOU will illuminate their discernment, their understanding and vision, that they are more aware of the battle and the source of what is coming at them. Father increase DISCERNMENT, the supernatural gifting, and anoint their senses to discern what spirit is on people or around them. Increase their love for the WORD of GOD since our senses are trained from the reading of it…and the understanding we get from Holy Spirit in doing so. Increase the angelic armies around Your people Lord and release the seven fold Spirit of GOD in greater measure we pray, for great darkness is here, and increasing and we need more of YOU LORD ! in the name and blood of JESUS, we pray ! THANK YOU LORD that You are doing it ! AMEN !